The Street-Legal IndyCar 2 Seater is the first of its kind to ever run on city streets just like a regular car! It is fully equipped with headlights, taillights, turn signals and is also plated by the state of Indiana! Just like the IndyCar Experience's high-speed 2 seater that operates at the Indianapolis Motor Speedway, this Dallara chassis has been stretched to fit two people. 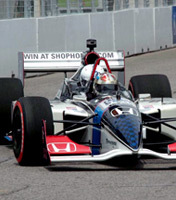 If you're planning to visit the Dallara IndyCar Factory with a small group or plan to lease the facility for a private event, then the street legal rides can easily take place on the streets of Speedway at our facility! Under the Contact Us page or Event Space page, please submit an event inquiry regarding your group visit, and one of our event managers will contact you shortly!